Hello, hello, paper fans! 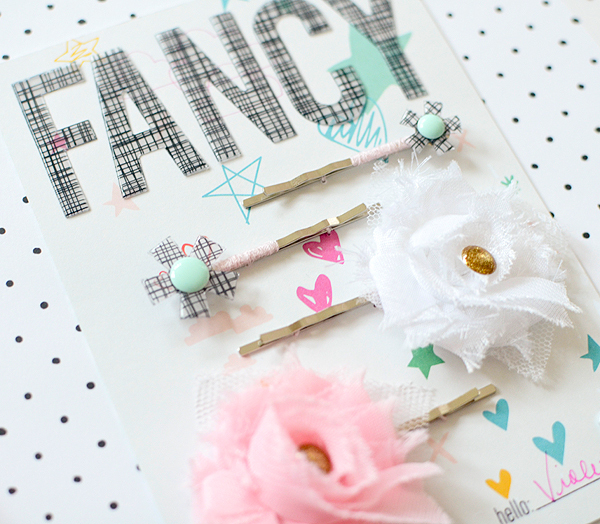 Have you come for the Gossamer Blue Blog Hop? You should have arrived from the lovely blog of Mel Blackburn if you're moving right along--no doubt she had something fantastic for you. If you've received your March kits, then you know how cool they are; if you don't have any yet, you'd better hurry because they're almost gone! I loved that they were very romantic and feminine, yet had a modern, graphic, edgy twist to them. For the black and mint sketch clips, I glued enamel dots to the asterisks from the alpha pack and then adhered those to the pins. 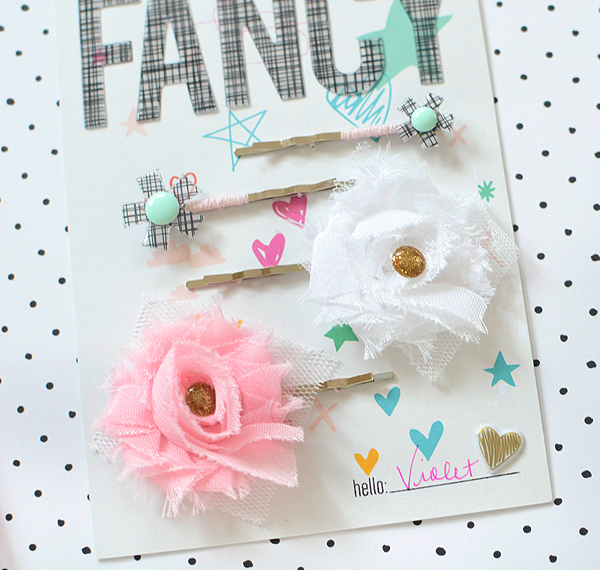 For a little extra detail, I wound pale pink thread around the top of each barrette several times and secured. This took some time, mainly because I'd never done anything like that before, but it's not difficult! To make the card, I simply trimmed down a piece of Pinkfresh Studio patterned paper and adhered that to a thicker stock--which happened to be the packaging that came with the tulle flowers. It's sturdy so it doesn't bow. 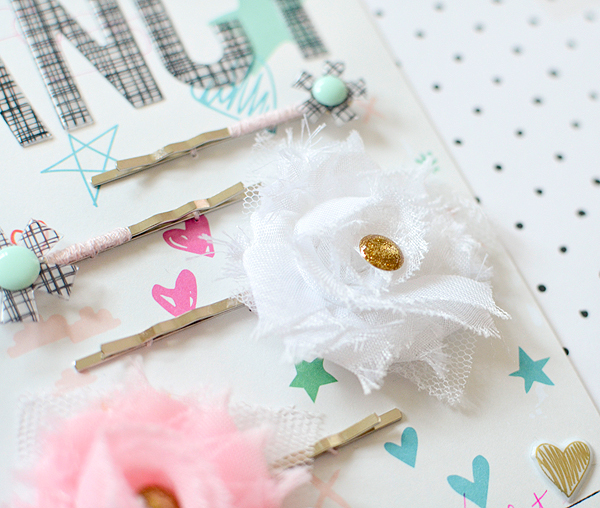 I laid out each pin, piercing 2 sets of holes on either side of them, then stitched the barrettes to the card. They'll stay put in transit but can easily be removed when Vi is ready to wear them. 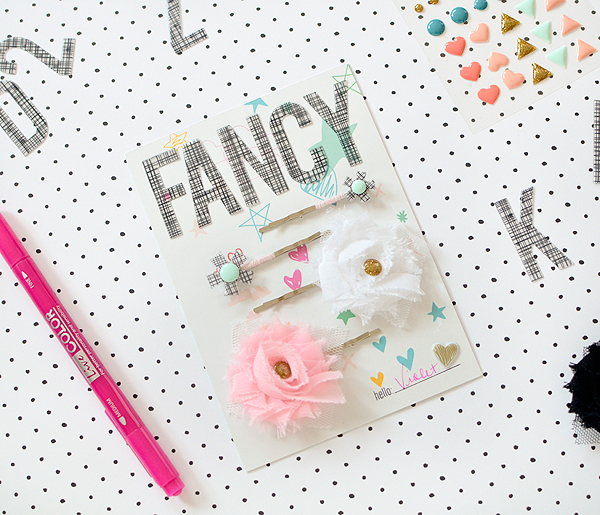 It needed a little something more at the top so I spelled out F-A-N-C-Y in the sketched alphas--I love the contrast of the graphic black and white against the playful and colorful doodles! The last thing I did was stamp 'hello' from the Main Kit stamp set so I could personalize the gift with my niece's name. Because the stamp has a border at the top that I didn't want to include, I masked it off with tape, inked it up, removed the tape, and then put stamp to paper so the image was just the word with the line after it. 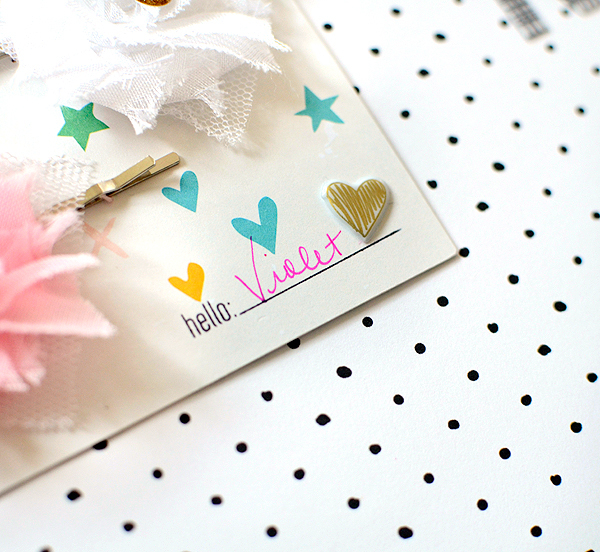 The gold heart puffy sticker is actually in the Life Pages Main Kit, and was added only because I tried to draw my own heart with the pink pen and seriously mucked it up! I should have known better; next time I will leave the doodling to the pros. 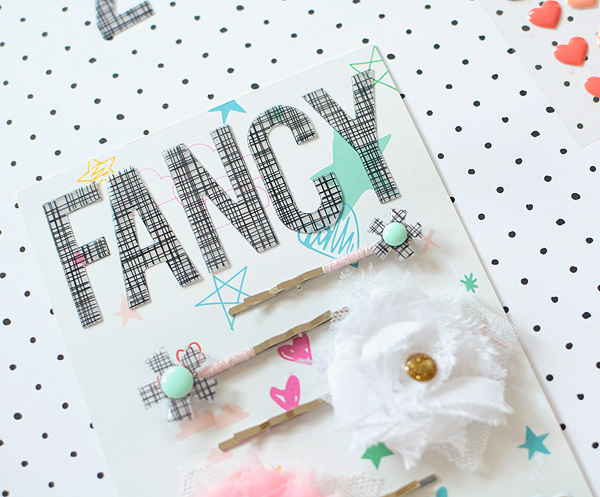 These were some super-fun kits and I hope you've been inspired today to put them to good use. Head on over to my friend Sabrina Alery's page now. In fact, I think I'll join you because I know she has something we won't want to miss! 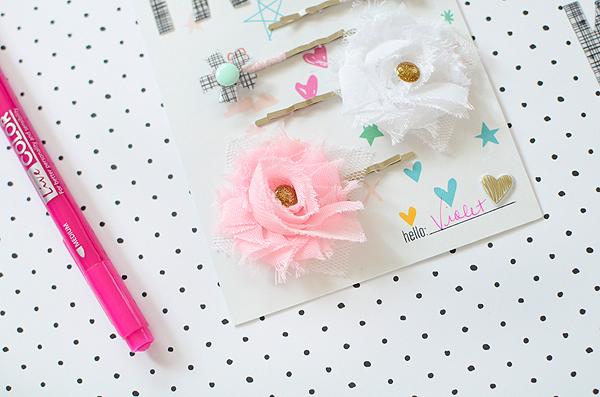 Those clips are super cute!